What should the next Ad Icon be? Are there any plans to release more of the Ad Icons? As much as I love Count Chocula, Frankenberry and Boo Berry, I would love to see more ad icons! These have been done as Wacky Wobblers (Sprout was done, but not the Jolly Green Giant, while Tony Tiger was done as a wobbler and a 12" talking wobble bank. Ronald, along with several of his friends - and the Grimace - became Wacky Wobblers as well). Check 'em out!!!! They'd go well with any Pop! collection. Alleycat wrote: These have been done as Wacky Wobblers (Sprout was done, but not the Jolly Green Giant, while Tony Tiger was done as a wobbler and a 12" talking wobble bank. Ronald, along with several of his friends - and the Grimace - became Wacky Wobblers as well). Check 'em out!!!! They'd go well with any Pop! collection. Nooooo! I can't start changing toy lines like that! Gotta remain faithful to my Pops. That way, if they don't make them, then my wallet can breathe a sigh of relief. How about Toucan Sam, Captain Crunch, Dave from Wendy`s, Taco bell dog! theres a few good ones there for Pop! Id also love to see the Coca-Cola polar bear with a bottle of Coke in his hand! The only bobble head that will ever be on my shelf is my old Pee Wee Herman one! 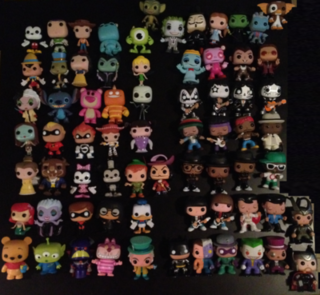 The three ad icon Pops are the only ones I kept when I sold off my Pops. I'd like to see my staple Cereal growing up get popped! Snap, Crackle and Pop! I think a line of Cereal Mascot POPS would be awesome, but Funko will never do it. They stopped with the advertising icons several years ago. Mcdonald POPs would be cool. I just picked up the Mcdonaldland figures that came out a few years ago. TanyaTate wrote: Mcdonald POPs would be cool. I just picked up the Mcdonaldland figures that came out a few years ago. That Mayor McCheese is adorable. i want! Those look great! I forgot all about Captain Crook! They didn't come out with a Birdie? There was a sixth figure, the "evil" four armed Grimace, from when he first appeared that was an exclusive. BTW I am astonished I know all this. Oh yeah, wasn't the Big Mac a cop or something along the lines? I don't recall the professor, I'll have to google that. Thanks for the info, I'm glad you do know all this, to keep me informed! I think it would be great if they made more of those iconic ad charcters from our childhood. Like for example they could do a McDonald's line and have Ronald, Grimace, Hamburgler, Early Birdie and a Fryguy. There's plenty others that they could do that would be awsome aswell like the A&W bear, and Lucky from lucky charms. What are your thoughts? I def agree with this! Nothing sparks up nostalgia like ads from when we were kids. There are tons of other cereal characters that should be done as well as other company mascots. I'm sure Brian has plenty of great ad ideas in the works. Hi, I'm Brandon and I gotta have my Pops!! We have all of those and thousands more in the way of wobblers. I was thinking the same thing. I was wondering why they decided to only make Count Chocula, Boo Berry, and Franken Berry Pops. More Ad Icon Pops would be nice. Hiya, My real name is Carla but everyone calls me Lily!! yes! and maybe a pillsbury doughboy? Fruit Brute and Yummy Mummy would be at the top of my list to complete the monsters set. After that, Pillsbury Doughboy, Green Giant, Lucky Charms, Cap'n Crunch and Tony the Tiger. Snap, Crackle and Pop would also be perfect. Pop the Pop! Yea I'm still waiting for fruits brute and yummy mummy to finish the set. lovetheangels wrote: We have all of those and thousands more in the way of wobblers. There definitely should be more ad icons!!! tabby1375 wrote: yes! and maybe a pillsbury doughboy? I agree!!!!! He's one of my favorites! I'm Krissy and I <3 Hello Kitty and MLP! hkcrazy88 wrote: There definitely should be more ad icons!!! POP PULPO PROTO NEEDED, BOTH COLOR AND ALL WHITE- PLEASE HELP ME FIND THEM! REAL MEN DON'T KEEP SCORE! SELL OUTS NEED TO RESTOCK SO THEY CAN SELL OUT AGAIN! 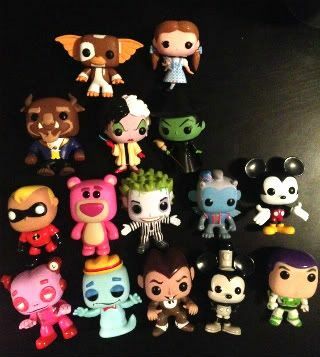 Brian@Funko wrote: GO boxless..it is more fun! Haters going to hate so let the cry babies cry! Pics or it didn't happen. I want to see that! I'd love to see a flocked Tony the Tiger chase. unoudid wrote: I'd love to see a flocked Tony the Tiger chase. We've already got General Mills Cereal characters in Pop form, all we need to do is expand that. We have Buzz the Honey Nut Cheerios Bee. There is 6 right there, enough for a set for sure. The names David! No Dave, Just David! And then the Pink Panther shows up and you're even more conflicted. I have always wondered why they made only three Ad POPs. I would of thought there would have been market for more of the iconic Ad figures. Big boy POP or Snap, Crakle, Pop POPs. That would have been a great question to have asked Brian at the Toy Fair. Most desired all White Protos:Uncle Si Wacky Wobbler, Uncle Si POP! & Jase POP! i'm fairly certain that this came up before, months ago, and brian said that the cereal monsters didn't sell well. (probably why they were retired.) at the time, he said that no other ad icons were in the works. that could have changed by now, but we certainly have not heard of anything in the pipeline. I totally agree with all of the previous posts in this thread!! !